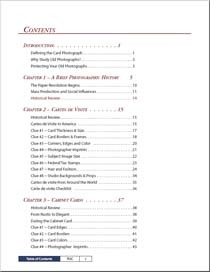 This KwikGuide presents a fresh and comprehensive approach to researching and dating 19th century photographs. By following the easy-to-use numbered clues, reviewing tables and checklists, and comparing images to their own, the researcher can easily become an expert at dating old photographs. By JM, March 30, 2013 - Best of the many I've looked at. - I've purchased a couple of books on dating 19th century photographs and looked at many more and this one is by far the best. 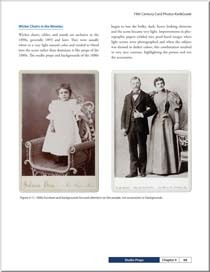 After a very short history of Carte de Visite's (CDV) and Cabinet Card photos, the majority of the book gives you clues in an orderly manner to date your photo. 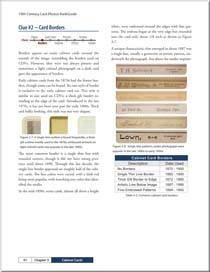 An example, for CDVs look first at thickness, then borders, corners, imprint, size, stamps, clothes,& studio, and the book explains in good depth what to look for under each heading. This book makes it easy to be accurate within just a few years. 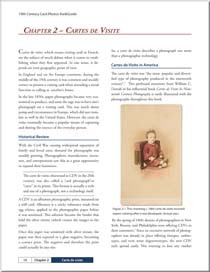 There are numerous charts and even a checklist for Carte de visites. It's just as informative for Cabinet Cards. Highly recommended. 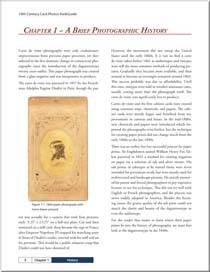 By PJ - May 14, 2013 - A great guide for identifying cabinet cards and CDVs. - I have a collection of Cabinet Cards and this book helped me learn a lot about them. There is ton of information and photos. You can date the photos by paper printed on, type of edging on card, is the printers name embellished or plain, the color of the card. Also pictures of the styles of hair and clothing help identify the age. I highly recommend this book which is truly a quick guide. 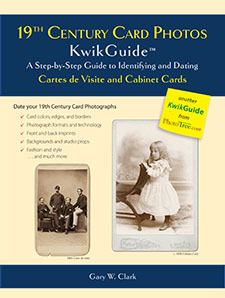 19th Century Card Photos KwikGuide presents a fun, interesting and easy-to-follow set of clues to guide genealogists, historians, and other researchers through the task of dating their card photographs from the 1800s. With over 200 high quality documented photographs included as examples for every clue, the researcher can accurately and with confidence determine most photograph dates within two to six years. 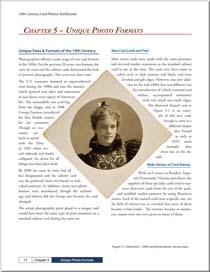 This book illustrates photographic technology changes that occurred frequently throughout the 19th century. These changes have been verified, tracked, and dated, providing a time line of identifiable characteristics. Traditional review of style and fashion are also included, many with new insight.